Is American International College safe? Find crime statistics for the college campus and the surrounding area. Can High Reported Crime Be A Good Sign? Nearly 1/3 of the colleges we analyzed either did not report crime or reported no incidents of crime. Zero incidents of reported crime may be nice to see, but it does not necessarily mean the school is safer, as it could indicate lax reporting. Higher incidents of reported crime could mean the school is stricter about law enforcement and reporting. Remember, just because incidents are not reported does not mean they do not happen. American International College reported 237 safety-related incidents involving students on or near campus or other American International College affiliated properties in 2017. Of the 2,795 colleges and universities that reported crime and safety data, 2,395 of them reported fewer incidents than this. Based on a student body of 3,539 that works out to about 66.97 reports per thousand students. In 2017, 2,495 colleges and universities reported fewer incidents per thousand students than did American International College. Crime and safety incidents fall into four broad categories. Disciplinary actions represented 82.3% of all incidents. Arrests related to possession represented 2.1% of all incidents. Violence against women represented 3.4% of all incidents. Arrests for major crimes represented 12.2% of all incidents. 98.7% of all incidents occurred on-campus. 0.4% of all incidents occurred in the Springfield neighborhood surrounding the campus. 0.8% of all incidents occurred off campus but while on school affiliated property. American International College reported 234 safety-related incidents involving students while on campus in 2017. Of the 2,795 colleges and universities that reported crime and safety data, 2,409 of them reported fewer incidents than this. Based on a student body of 3,539 that works out to about 66.12 reports per thousand students. In 2017, 2,526 colleges and universities reported fewer incidents per thousand students than did American International College. Disciplinary actions represented 83.3% of all on-campus incidents. Arrests related to possession represented 2.1% of all on-campus incidents. Violence against women represented 2.6% of all on-campus incidents. Arrests for major crimes represented 12.0% of all on-campus incidents. American International College reported 1 safety-related incidents involving students while on Springfield public property near campus in 2017. Of the 2,795 colleges and universities that reported crime and safety data, 1,661 of them reported fewer incidents than this. Based on a student body of 3,539 that works out to about 0.28 reports per thousand students. In 2017, 1,792 colleges and universities reported fewer incidents per thousand students than did American International College. Disciplinary actions represented none of all campus neighborhood incidents. Arrests related to possession represented none of all campus neighborhood incidents. Violence against women represented none of all campus neighborhood incidents. Arrests for major crimes represented 100.0% of all campus neighborhood incidents. American International College reported 2 safety-related incidents involving students while off campus but still on property owned or controlled by the school in 2017. Of the 1,470 colleges and universities that reported crime and safety data, 959 of them reported fewer incidents than this. Based on a student body of 3,539 that works out to about 0.57 reports per thousand students. In 2017, 1,057 colleges and universities reported fewer incidents per thousand students than did American International College. Disciplinary actions represented none of all off-campus incidents. Arrests related to possession represented none of all off-campus incidents. Violence against women represented 100.0% of all off-campus incidents. Arrests for major crimes represented none of all off-campus incidents. Even in low-crime areas, students still run the risk of encountering violence and unsafe situations. 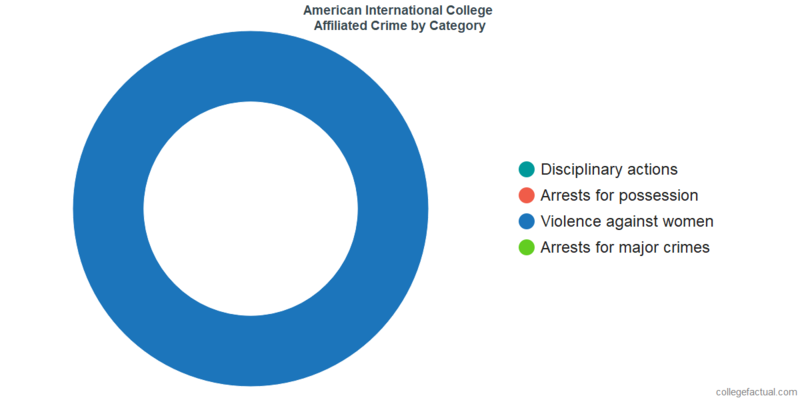 What kind of policies does American International College have in place to protect students or help students who are victims of crimes? 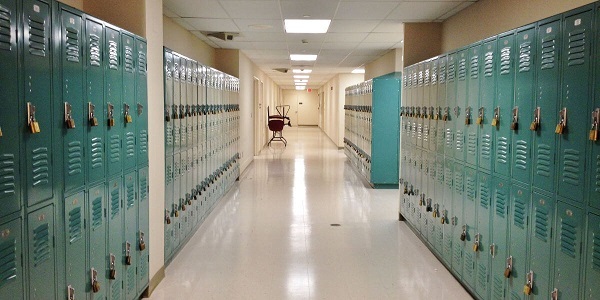 How secure are the dorm rooms and other buildings? Would a break in be easy for an intruder? What kind of punishments or penalties are in place for students accused of or convicted of crimes? One way a student may feel more comfortable might be to take a self-defense or safety class. Are there classes like this offered at American International College?